It is a timely, revealing book — to be released just as the election season peaks. “Shall Not Be Infringed: The New Assaults on Your Second Amendment” by David A. Keene and Thomas L. Mason will be published Oct. 11. The authors offer a meticulous review of the gun control debate in America and an inside look at strategic operatives who use polls, studies and numbers to confuse the public and muddle facts. “The battle over the Second Amendment right of Americans to keep and bear arms has been a central part of the political debate in this country since the late 1960s, with those blaming the availability of various kinds of firearms for crime, mass killings and much else lining up against those who believe strongly that the Constitution protects the age-old right of people to defend themselves, their families and their homes in an increasingly dangerous world,” said Mr. Keene, opinion editor of The Washington Times and former president of the National Rifle Association. “We wanted to tell the story of how gun owners have successfully fought to preserve their rights in the face of a well-financed and unrelenting assault that may well decide the 2016 presidential election,” said Mr. Keene of the book, which tracks warfare over the Second Amendment in courts, Congress and state legislatures — and the role of a hostile news media during the crossfire. “We chose this time to let people know how important these rights are, to dispel the myths about guns and crime that dominate the media and to suggest that if people would stop yelling, there are steps that can be taken to make our streets and cities safer without infringing on the constitutional rights of law-abiding Americans,” Mr. Keene continues. “The simple fact is that the Second Amendment and the rights it protects are on the ballot this year. For the first time, the gloves are off as Hillary Clinton claims the Supreme Court was wrong in deciding that Americans have an individual right to own a gun for protection and that Great Britain and Australia — two nations that have outlawed and confiscated most privately owned firearms within their borders — are models we should both admire and follow,” he added. 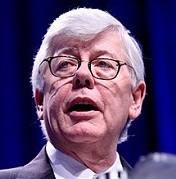 Martha Raddatz (8 percent), NBC’s Chuck Todd (7 percent), CNN’s Chris Cuomo (6 percent), ABC’s George Stephanopoulous (5 percent), CNN’s Don Lemon (5 percent), CBS’ John Dickerson (4 percent), CNN’s Jake Tapper (4 percent), CNBC’s Becky Quick (3 percent), Salem Media’s Hugh Hewitt (3 percent), PBS’ Gwen Ifill (3 percent), CNBC’s Carl Quintanilla (3 percent) and CNBC’s John Harwood (2 percent). CAVUTO’S RETURN It’s been only four months since Fox News stalwart Neil Cavuto had open-heart surgery. He already has announced his return to the airwaves, however. The big day is Sept. 6, when the straightforward Mr. Cavuto will take his place in the anchor’s chair at high noon on the Fox Business Network, and 4 p.m. on Fox News. Mr. Cavuto, 57, serves as senior vice president, anchor and managing editor of business for both networks.